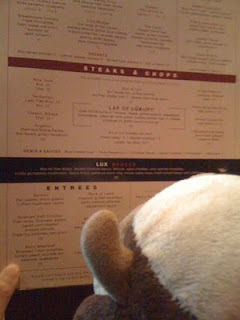 Mr. Moo's Adventures: Birthday Dinner @ Lux Steakhouse! But Chef Matt and Chef Eric came out right away to greet me once they heard I'd arrived! What a great way to make a cow feel welcome! They also promised not to cook me. Yay! 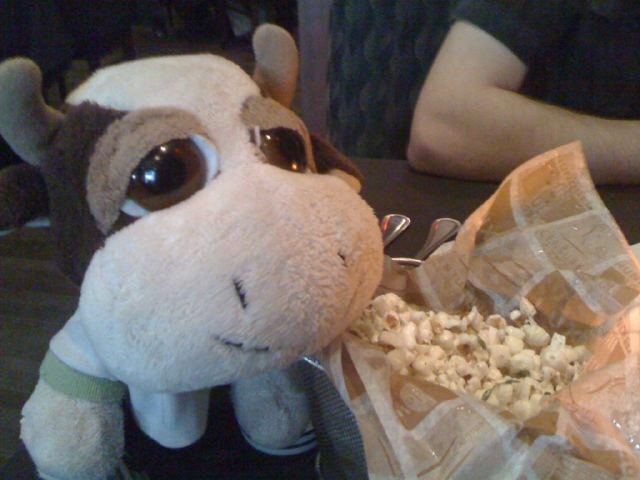 While I was trying to decide what to eat, Chef Eric brought me out some duck fat popcorn! It was super nummy! Decisions, decisions. Plenty of non bovine options to choose from. Yet the food turned out to be fantastic! Definitely some bovine friendly options available. The humans decided to start with feeb carpacio, then I would have the rack of lamb and lobster poutine. Though after a recommendation from their server, Ed, they wound up trying the feeb tartar. Although I refrained from the feeb tartar for obvious reasons, the humans said it was delicious (I'll smack them for this later) and did not taste as feeby as they thought it would be. They also said it had a very smooth texture and the egg on top was a very nice way to mix the capers, and tartar together to spread on the crostinis for eating. The man hum had *gasp* feeb short ribs!!!! I almost fainted!!! He claimed it was super soft, tasty and the horseradish mash underneath was good and woke him up. Also the special side of the day, was a lobster poutine with a bacon hollandaise. It was slightly salty, likely due to the bacon hollandaise, but good none the less! It was as good as Chef Shufelt, Chef Tony, Chef Eric and Chef Matt had advertised all week on Twitter. Even the man hum who is definitely not a poutine fan and was weary of the thought of having a poutine at Lux, was won over! After their appetizer, my mains finally arrived. A very delicious and medium rare rack of lamb. Much more lamb than I was expecting, with mashed potato underneath. It was very soft and moovealous tasting! To finish a trio of sorbet! Mixed berry, pineapple and peach, and chocolate bourbon! My favorite was the chocolate bourbon! The man hum had a maple bourbon carrot cake, which he really liked, particularly with the raisins in it. Thanks to the crew at Lux Steakhouse for a mootastic birthday meal! Yummy...lovely photos and great review! I had the carrot cake too when I was there.